Sixty years ago, Guernsey was a different place in many respects. The island was still recovering from the hostile invasion of World War 2, and working hard to get the economy back on track. Public Transport was relied upon far more heavily than in the modern day, and there were several operators providing the bus network around Guernsey. The Watson brothers were one such operator, with a small yet distinctive fleet of grey and black liveried buses, mainly dedicated to providing the route 11 service. What also stood “The Greys” apart from the other buses of the day was the attention to detail, with 'that little bit extra' as far as chrome trim, polished wood veneer and the like – they really gleamed! In 1954, the newest addition to the fleet was a Reading bodied Albion Victor 35 seater bus – allocated the registration 1787. She proved to be a popular workhorse, taking children to school, people to work and town to go shopping, and then at the weekends providing transport for Sunday School outings and such like. 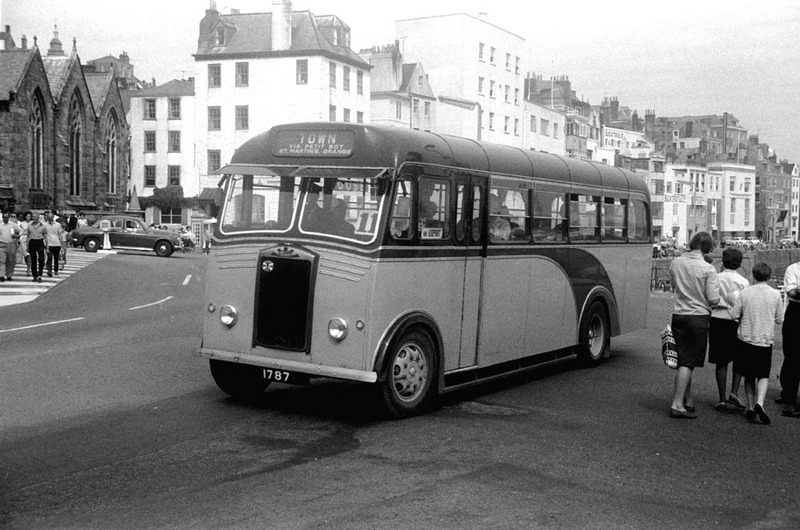 1787, along with her sister vehicles, remained with the Watsons until 1978, when they were the last of the independents to sell to the Guernsey Motors operation, bringing the entire network under a single operator. Some of the fleet were repainted – one was re-engined, however 1787 stayed just the way she was. 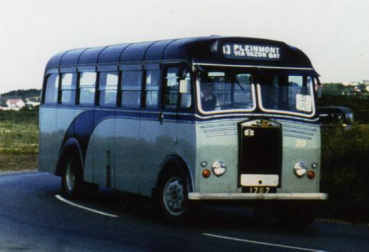 Following a buyout, the fleet of the day was sold off individually at auction – with many of the buses leaving Guernsey for good. After a brief spell in the UK, 1787 returned to Guernsey, and after restoration work, began running “Discover Old Guernsey” tours in the late 1980s. Once again, she bid goodbye to Guernsey and headed for Cumbria, where she spent time at the Lakeland Motor Museum. We tracked her down in 2012, in Devon, where enthusiast Ron Greet was looking after her. After a bit of friendly persuasion, he kindly agreed to let us bring her back to Guernsey, and so, after months of negotiation, preparation work, and gaining the relevant permits, 1787 returned ! While a 1954 bus is never going to offer the level of extras that are expected as matter of course on modern vehicles, a journey on our Albion is sure to bring back memories for those that remember, and a whole new experience for those that don't ! 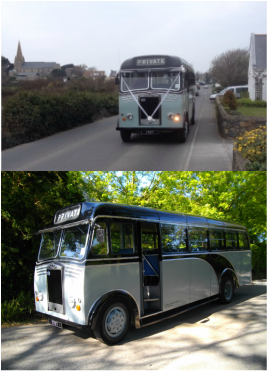 Currently licensed to carry 35 passengers (one less than the original 36 due to current legislation), and now fitted with a public address system, we are able to offer this original Watsons Grey for private hire (weddings, nostalgic outings) and guided tours, as well as regular pre-booked Route 11 bus rides. Please call us on 01481 700066 to find out more. Please note: due to the age of the Albion Victor, there may be occasions where we are unable to provide the vintage vehicle. In the unlikely event of such circumstances we will endeavour to provide a replacement service using a coach from our modern fleet. For pre-booked nostalgic bus tours and trips we will offer a re-scheduled alternative date and time, or a full refund. The Watson's Greys Albion (above) is available to book for weddings, nostalgic trips and other special occasions. Please call us, or email info@intransit.gg for more information and to check availability.